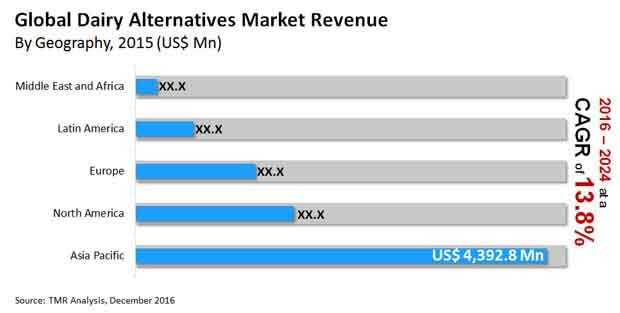 The global dairy alternatives market has been witnessing an escalating graph for competition over the past years. The neck and neck competition amongst market players owes to the tremendous scope for growth in the global dairy alternatives market. The propensities of the masses with regards to the usage of dairy products have changed as a large chunk of the global population has started following vegan diets. Hence, there is an expansive consumer base for the manufacturers of alternative dairy products, and each market player is on a quest to capture a substantial market share. Despite the intense competition in the market, some of the market players have succeeded in establishing their supremacy in the market through rational business strategies. Living Harvest Foods Inc., The Hein Celestial Group Inc., and Earth’s Own Food Co. Inc. are some of the market players with strongholds in the global market for dairy alternatives. These vendors have resorted to a range of strategies including manufacture of better tasting products, attractive packaging, and enhancing nutritional value of the products. It is anticipated that these businesses would keep expanding over the forthcoming years at the back of their effective plans and strategies. Blue Diamond Growers, Freedom Foods Group Limited, Archer Daniels Midland Company, and E. I. du Pont de Nemours and Company are amongst other key players in the global dairy alternatives market. Transparency Market Research (TMR) published a report that foresees a growth trajectory for the global dairy alternatives market over the period between 2016 and 2024. The report reveals that that the global dairy alternatives market was valued at US$9.32 bn in 2016 and is expected to elevate to a value of US$26.31 bn by the end of 2024. For a long period of time, people have used dairy products as an indispensable part of their food habits. Furthermore, fresh dairy products were considered to be one of the healthiest forms of food until some time ago. However, over the past decade, people have been made aware of the advantages served by dairy alternatives over dairy products. Hence, the demand within the global dairy alternatives market has soared to new heights in recent times. Almond milk, soy milk, oat milk, rice milk, and hazelnut milk are now readily available across groceries and retail shops which has further escalated demand within the global market for dairy alternatives. Despite the seemingly affluent growth of the market, the high costs of dairy alternatives could hamper demand within the market. Asia Pacific emerged as the leading regional segment in the global dairy alternatives market 2015. The high adoption rate of healthy food options across the region coupled with the presence of several manufacturers of dairy alternatives is expected to expand the regional market over the coming years. The market players are expected to target the audience in the Asia Pacific region because of the increasing spending capacity and high population of countries such as India and China. The review is based on a market research report titled, “Dairy Alternatives Market (Products - Soy Milk, Almond Milk, Rice Milk, and Coconut Milk; Formulation - Plain Formulation and Flavored Formulation; Applications - Food and Beverages; Distribution - Large Retail, Small Retail, Specialty Stores, and Online) - Global Industry Analysis, Size, Share, Growth, Trends and Forecast 2016 – 2024”.